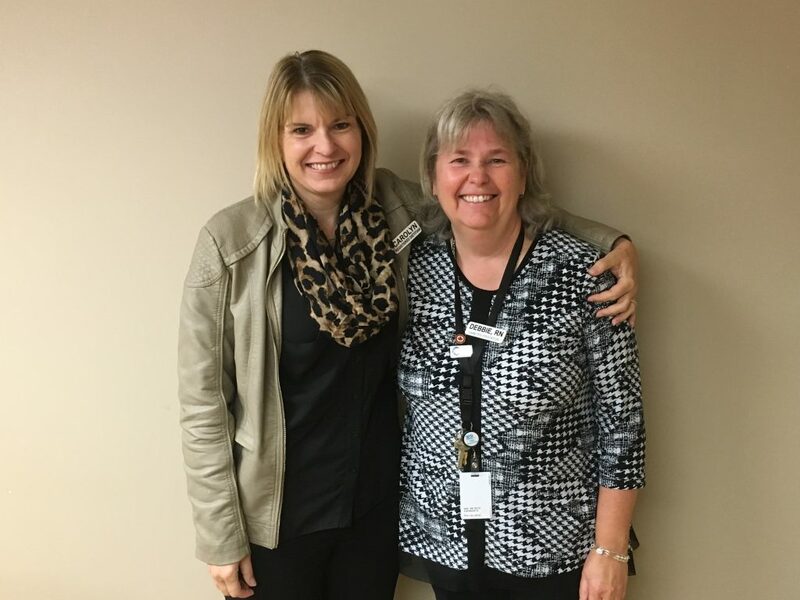 Registered Dietician Carolyn Corbin and Diabetes Program Manager at Belleville General Hospital Debbie Donahue are both working together to help educate the general public on diabetes and its severities. Photo by Brock Ormond, QNet News. BELLEVILLE – November is Diabetes Awareness Month in Canada and people who suffer from the condition, as well as healthcare professionals, are looking to educate the public about this difficult disease. Insulin is essential for controlling the amount of sugar in the blood, so diabetes causes high blood-sugar levels as a result. There are currently over 11 million Canadians are currently living with diabetes or pre-diabetes, and 1.5 million of them have undiagnosed diabetes. Kristin Herriott, an Educational Assistant (Child and Youth Worker) for the York Region District School Board, had a different diagnosis than others with the condition growing up. “For me growing up, I wasn’t around people with diabetes, it was just me in a normal environment with normal kids. So I really didn’t get to appreciate it that much,” she said. It wasn’t until she started volunteering for the Diabetes Hope Foundation (DHF), which runs out of Mississauga, Ont. several years ago, that she fully began to appreciate what the month of November means to long-suffering diabetics. Herriott was diagnosed with hypoglycemia as a young child as a result of numerous seizures. It is a condition that mirrors diabetes, where there is a deficiency of glucose (sugar) in the bloodstream. Herriott works with special needs children, which requires her to be attentive at all times to her job and not necessarily to herself. The big thing, Herriott says, is being able to remember to eat all of her meals during the course of the day, which is something that she does to help her keep her levels up throughout the day. “I do really well at managing myself…I’ll make sure that I’m at a higher than normal level, just so that I’m able to get through my day until lunch time or snack time,” Herriott explains. Locally, diabetic clinics are set up at both Belleville and Trenton hospitals. Debbie Donahue, manager of the diabetes program at Belleville General Hospital, coordinates referrals that come in, as well as out-patient sessions in the community. Donahue says she believes there is a lot more being done these days to educate people about the condition. “Pharmacists are now teaching insulin and teaching education more to the public. Family health teams, clinics, hospitals such as us and pharmacists are all working together to try to bring the word out,” she said. Belleville General Hospital runs two clinics, paediatric for ages zero to 18 and adult for ages 18 plus. Donahue says 55 hundred clients come through the clinic each year. Registered dietitian and certified diabetes educator Carolyn Corbin adds that she educates diabetes awareness in her job as well, including healthy eating, exercise, medication and mental health screening. “It’s a well-rounded education session to try and help people better manage their diabetes,” Corbin said. Donahue had a positive attitude when asked about whether or not there will be a cure for diabetes in the future. “I’m hopeful, but at the same time, it’s not something that’s going to come right away,” she added. For more information on Diabetes Awareness Month, diabetes itself, and to donate, visit the Canadian Diabetes Association website. 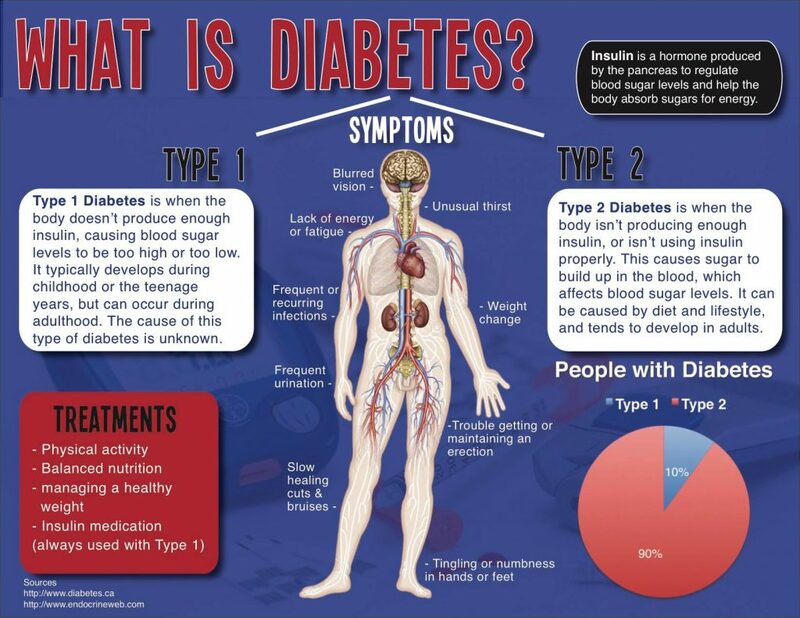 Also, check out the infographic below for different types of diabetes, related symptoms and more.